From its very beginning, Kendal at Oberlin has enjoyed a close and mutually beneficial relationship with Oberlin College. Residents can audit classes at no cost with permission from the professor. They attend concerts and recitals at the Conservatory of music, as well as lectures of all sorts. Conservatory students appreciate the opportunity to perform for a diverse and critical audience, and Kendal residents help create that opportunity. The calendar of activities at Kendal almost always has events where Oberlin College students and faculty are performing or presenting a lecture. And the Kendal bus will transport residents to several on-campus activities each month. So many opportunities exist for programming through the College. The Conservatory of Music alone offers over 500 performances throughout the academic year. Students and professors have collaborated with Kendal at Oberlin on energy and environmental initiatives. Both organizations are committed to being good stewards of the environment. 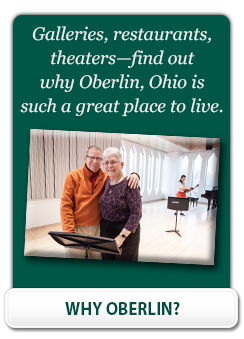 About 37% of Kendal at Oberlin residents are alumni or former faculty and staff. Others come to Kendal because their children are employed at the College. And some come just because they are drawn to the college-town atmosphere and the environment of Oberlin.